Definition at line 40 of file AMDGPUDisassembler.h. Definition at line 96 of file AMDGPUDisassembler.h. Definition at line 49 of file AMDGPUDisassembler.h. References llvm::Address, convertMIMGInst(), convertSDWAInst(), createRegOperand(), createSRegOperand(), decodeOperand_SReg_128(), decodeOperand_SReg_256(), decodeOperand_SReg_32(), decodeOperand_SReg_32_XEXEC_HI(), decodeOperand_SReg_32_XM0_XEXEC(), decodeOperand_SReg_512(), decodeOperand_SReg_64(), decodeOperand_SReg_64_XEXEC(), decodeOperand_SRegOrLds_32(), decodeOperand_VGPR_32(), decodeOperand_VReg_128(), decodeOperand_VReg_64(), decodeOperand_VReg_96(), decodeOperand_VRegOrLds_32(), decodeOperand_VS_128(), decodeOperand_VS_32(), decodeOperand_VS_64(), decodeOperand_VSrc16(), decodeOperand_VSrcV216(), errOperand(), getInstruction(), getRegClassName(), MI, Size, tryDecodeInst(), and ~AMDGPUDisassembler(). Definition at line 294 of file AMDGPUDisassembler.cpp. References assert(), llvm::countPopulation(), llvm::MCOperand::createReg(), llvm::SIInstrFlags::Gather4, llvm::MCOperand::getImm(), llvm::AMDGPU::getMaskedMIMGOp(), llvm::MCRegisterInfo::getMatchingSuperReg(), llvm::AMDGPU::getNamedOperandIdx(), llvm::MCInst::getOpcode(), llvm::MCInst::getOperand(), llvm::MCOperand::getReg(), llvm::MCRegisterInfo::getRegClass(), llvm::MCRegisterInfo::getSubReg(), llvm::AMDGPU::hasPackedD16(), llvm::MCInst::setOpcode(), llvm::MCDisassembler::STI, and llvm::MCDisassembler::Success. 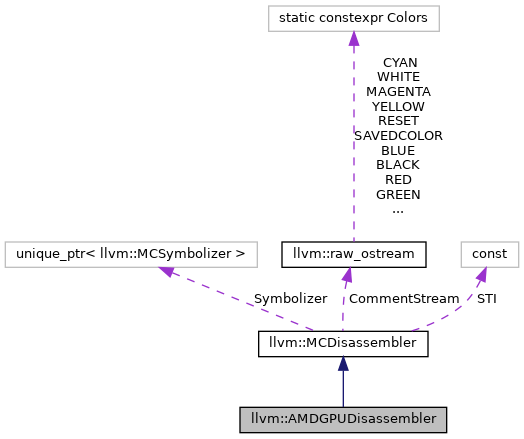 Referenced by AMDGPUDisassembler(), and getInstruction(). Definition at line 272 of file AMDGPUDisassembler.cpp. References llvm::MCOperand::createImm(), createRegOperand(), llvm::MCSubtargetInfo::getFeatureBits(), llvm::AMDGPU::getNamedOperandIdx(), llvm::MCInst::getOpcode(), insertNamedMCOperand(), llvm::MCDisassembler::STI, and llvm::MCDisassembler::Success. Definition at line 393 of file AMDGPUDisassembler.cpp. References llvm::MCOperand::createReg(), llvm::AMDGPU::getMCReg(), and llvm::MCDisassembler::STI. Referenced by AMDGPUDisassembler(), convertSDWAInst(), createRegOperand(), createSRegOperand(), decodeOperand_VGPR_32(), decodeOperand_VReg_128(), decodeOperand_VReg_64(), decodeOperand_VReg_96(), decodeSDWASrc(), decodeSDWAVopcDst(), decodeSpecialReg32(), decodeSpecialReg64(), and decodeSrcOp(). Definition at line 398 of file AMDGPUDisassembler.cpp. References createRegOperand(), errOperand(), and getRegClassName(). Definition at line 408 of file AMDGPUDisassembler.cpp. References llvm::MCDisassembler::CommentStream, createRegOperand(), getRegClassName(), and llvm_unreachable. Referenced by AMDGPUDisassembler(), decodeDstOp(), decodeSDWASrc(), decodeSDWAVopcDst(), and decodeSrcOp(). Definition at line 753 of file AMDGPUDisassembler.cpp. References assert(), createSRegOperand(), getSgprClassId(), getTtmpClassId(), getTTmpIdx(), llvm_unreachable, OPW256, OPW512, llvm::AMDGPU::EncValues::SGPR_MAX, and llvm::AMDGPU::EncValues::SGPR_MIN. Referenced by decodeOperand_SReg_256(), and decodeOperand_SReg_512(). Definition at line 638 of file AMDGPUDisassembler.cpp. References assert(), llvm::MCOperand::createImm(), getInlineImmVal16(), getInlineImmVal32(), getInlineImmVal64(), llvm::AMDGPU::EncValues::INLINE_FLOATING_C_MAX, llvm::AMDGPU::EncValues::INLINE_FLOATING_C_MIN, llvm_unreachable, OPW16, OPW32, OPW64, and OPWV216. Referenced by decodeSDWASrc(), and decodeSrcOp(). Definition at line 553 of file AMDGPUDisassembler.cpp. References assert(), llvm::MCOperand::createImm(), llvm::AMDGPU::EncValues::INLINE_INTEGER_C_MAX, llvm::AMDGPU::EncValues::INLINE_INTEGER_C_MIN, and llvm::AMDGPU::EncValues::INLINE_INTEGER_C_POSITIVE_MAX. Definition at line 538 of file AMDGPUDisassembler.cpp. References llvm::MCOperand::createImm(), errOperand(), and llvm::ArrayRef< T >::size(). Definition at line 526 of file AMDGPUDisassembler.cpp. Definition at line 530 of file AMDGPUDisassembler.cpp. Definition at line 492 of file AMDGPUDisassembler.cpp. Referenced by AMDGPUDisassembler(), decodeOperand_SReg_32_XEXEC_HI(), and decodeOperand_SReg_32_XM0_XEXEC(). Definition at line 505 of file AMDGPUDisassembler.cpp. Definition at line 499 of file AMDGPUDisassembler.cpp. Definition at line 534 of file AMDGPUDisassembler.cpp. Definition at line 518 of file AMDGPUDisassembler.cpp. Definition at line 522 of file AMDGPUDisassembler.cpp. Definition at line 511 of file AMDGPUDisassembler.cpp. Definition at line 467 of file AMDGPUDisassembler.cpp. Definition at line 488 of file AMDGPUDisassembler.cpp. Definition at line 480 of file AMDGPUDisassembler.cpp. Definition at line 484 of file AMDGPUDisassembler.cpp. Definition at line 476 of file AMDGPUDisassembler.cpp. Definition at line 455 of file AMDGPUDisassembler.cpp. Definition at line 447 of file AMDGPUDisassembler.cpp. Definition at line 451 of file AMDGPUDisassembler.cpp. Definition at line 459 of file AMDGPUDisassembler.cpp. Definition at line 463 of file AMDGPUDisassembler.cpp. Definition at line 825 of file AMDGPUDisassembler.cpp. References createRegOperand(), createSRegOperand(), decodeFPImmed(), decodeIntImmed(), decodeSpecialReg32(), llvm::MCSubtargetInfo::getFeatureBits(), getSgprClassId(), getTtmpClassId(), getVgprClassId(), llvm::AMDGPU::EncValues::INLINE_FLOATING_C_MAX, llvm::AMDGPU::EncValues::INLINE_FLOATING_C_MIN, llvm::AMDGPU::EncValues::INLINE_INTEGER_C_MAX, llvm::AMDGPU::EncValues::INLINE_INTEGER_C_MIN, llvm_unreachable, SDWA, llvm::AMDGPU::SDWA::SRC_SGPR_MAX, llvm::AMDGPU::SDWA::SRC_SGPR_MIN, llvm::AMDGPU::SDWA::SRC_TTMP_MAX, llvm::AMDGPU::SDWA::SRC_TTMP_MIN, llvm::AMDGPU::SDWA::SRC_VGPR_MAX, llvm::AMDGPU::SDWA::SRC_VGPR_MIN, and llvm::MCDisassembler::STI. Referenced by decodeSDWASrc16(), and decodeSDWASrc32(). Definition at line 864 of file AMDGPUDisassembler.cpp. Definition at line 868 of file AMDGPUDisassembler.cpp. Definition at line 872 of file AMDGPUDisassembler.cpp. References assert(), createRegOperand(), createSRegOperand(), decodeSpecialReg64(), llvm::MCSubtargetInfo::getFeatureBits(), getSgprClassId(), getTtmpClassId(), getTTmpIdx(), OPW64, SDWA, llvm::AMDGPU::EncValues::SGPR_MAX, llvm::MCDisassembler::STI, llvm::AMDGPU::SDWA::VOPC_DST_SGPR_MASK, and llvm::AMDGPU::SDWA::VOPC_DST_VCC_MASK. Definition at line 772 of file AMDGPUDisassembler.cpp. Definition at line 805 of file AMDGPUDisassembler.cpp. Referenced by decodeSDWAVopcDst(), and decodeSrcOp(). Definition at line 714 of file AMDGPUDisassembler.cpp. References assert(), createRegOperand(), createSRegOperand(), decodeFPImmed(), decodeIntImmed(), decodeLiteralConstant(), decodeSpecialReg32(), decodeSpecialReg64(), getSgprClassId(), getTtmpClassId(), getTTmpIdx(), getVgprClassId(), llvm::AMDGPU::EncValues::INLINE_FLOATING_C_MAX, llvm::AMDGPU::EncValues::INLINE_FLOATING_C_MIN, llvm::AMDGPU::EncValues::INLINE_INTEGER_C_MAX, llvm::AMDGPU::EncValues::INLINE_INTEGER_C_MIN, llvm::AMDGPU::EncValues::LITERAL_CONST, llvm_unreachable, OPW16, OPW32, OPW64, OPWV216, llvm::AMDGPU::EncValues::SGPR_MAX, llvm::AMDGPU::EncValues::SGPR_MIN, llvm::AMDGPU::EncValues::VGPR_MAX, and llvm::AMDGPU::EncValues::VGPR_MIN. Referenced by decodeOperand_SReg_128(), decodeOperand_SReg_32(), decodeOperand_SReg_64(), decodeOperand_SReg_64_XEXEC(), decodeOperand_SRegOrLds_32(), decodeOperand_VRegOrLds_32(), decodeOperand_VS_128(), decodeOperand_VS_32(), decodeOperand_VS_64(), decodeOperand_VSrc16(), and decodeOperand_VSrcV216(). Definition at line 383 of file AMDGPUDisassembler.cpp. Referenced by AMDGPUDisassembler(), createRegOperand(), decodeLiteralConstant(), decodeSpecialReg32(), and decodeSpecialReg64(). Instr - An MCInst to populate with the contents of the instruction. Size - A value to populate with the size of the instruction, or the number of bytes consumed while attempting to decode an invalid instruction. Address - The address, in the memory space of region, of the first byte of the instruction. Bytes - A reference to the actual bytes of the instruction. VStream - The stream to print warnings and diagnostic messages on. CStream - The stream to print comments and annotations on. - MCDisassembler::Success if the instruction is valid, MCDisassembler::SoftFail if the instruction was disassemblable but invalid, MCDisassembler::Fail if the instruction was invalid. Definition at line 174 of file AMDGPUDisassembler.cpp. References llvm::MCDisassembler::CommentStream, convertMIMGInst(), convertSDWAInst(), llvm::MCOperand::createImm(), llvm::MCDisassembler::Fail, llvm::MCSubtargetInfo::getFeatureBits(), llvm::MCInst::getOpcode(), insertNamedMCOperand(), llvm::SIInstrFlags::MIMG, llvm::report_fatal_error(), llvm::ArrayRef< T >::size(), llvm::ArrayRef< T >::slice(), llvm::MCDisassembler::STI, and tryDecodeInst(). Definition at line 377 of file AMDGPUDisassembler.cpp. Referenced by AMDGPUDisassembler(), createRegOperand(), and createSRegOperand(). Definition at line 671 of file AMDGPUDisassembler.cpp. References assert(), OPW128, OPW16, OPW256, OPW32, OPW512, OPW64, OPW_FIRST_, OPW_LAST_, and OPWV216. Referenced by decodeDstOp(), decodeSDWASrc(), decodeSDWAVopcDst(), and decodeSrcOp(). Definition at line 688 of file AMDGPUDisassembler.cpp. Definition at line 705 of file AMDGPUDisassembler.cpp. References isGFX9(), llvm::AMDGPU::EncValues::TTMP_GFX9_MAX, llvm::AMDGPU::EncValues::TTMP_GFX9_MIN, llvm::AMDGPU::EncValues::TTMP_VI_MAX, and llvm::AMDGPU::EncValues::TTMP_VI_MIN. Referenced by decodeDstOp(), decodeSDWAVopcDst(), and decodeSrcOp(). Definition at line 656 of file AMDGPUDisassembler.cpp. References assert(), OPW128, OPW16, OPW32, OPW64, OPW_FIRST_, OPW_LAST_, and OPWV216. Definition at line 897 of file AMDGPUDisassembler.cpp. Definition at line 893 of file AMDGPUDisassembler.cpp. Definition at line 157 of file AMDGPUDisassembler.cpp. References assert(), llvm::X86Disassembler::decodeInstruction(), llvm::MCDisassembler::Fail, llvm::MCInst::getNumOperands(), llvm::MCInst::getOpcode(), llvm::MCDisassembler::STI, and llvm::MCDisassembler::Success.